Best Books for 8 Year Old Boys: Titles That Are Total Winners! After looking at a LOT of books, we decided on the best books for 8 year old boys. These are the books that will keep their interest and keep them reading book after book! When you are through here, be sure to check out my best books for boys page as it has many book lists to help you find super books for him. At age 8 most boys are in around the 3rd grade. They are ready for longer books and books that have more character development. A rush to longer chapter books can leave some boys behind and have them feeling frustrated with reading. We do no want that, so be careful not to push. 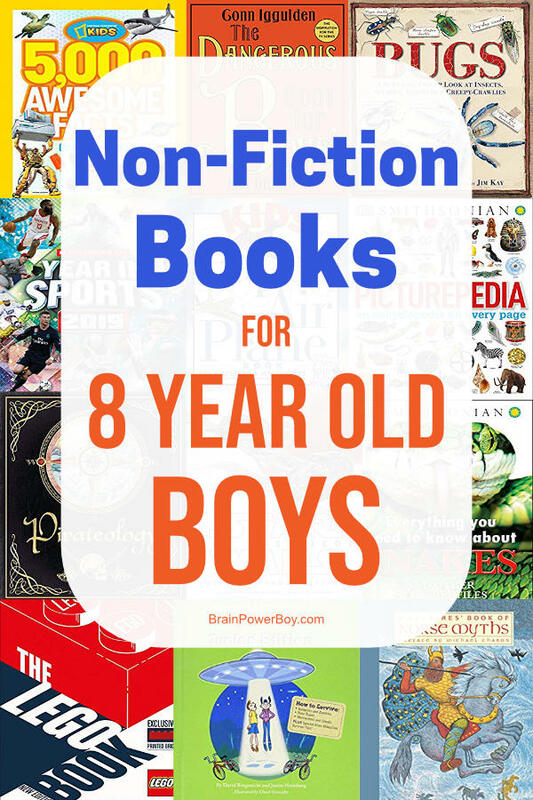 Many boys age 8 are interested in factual books, so as always, we have included some wonderful non-fiction titles, as well as fiction titles, for them read. 8-year-olds are still learning about reading even if they know how to read. What do I mean by this? Well, there is a lot more to reading than simply reading the words. They are starting to understand character development much more than they have before and the books they read now will be getting a bit longer and have longer sentences and paragraphs. They will also begin to have more complex story lines. Whether or not your boy is reading well on his own, use this book list to find great books for you to explore together. Get some for him to read on his own, but even though he is getting older, don’t stop reading to him! (Please!!) Enjoying books together is such a joy. When I am choosing books for these lists, I focus on what boys this age actually like, and that I want boys to love reading. I’ve seen plenty of book lists that are full of books that adults think kids should read. Not books that they will actually want to read. I don’t do my lists that way. Hopefully, you will find some that he wants to read and re-read. Those are the winners. In all of the by-age book lists I am taking a moment to say a bit about reading level. I fully admit that I never choose books by reading level. I usually just go by the topic and find books I think would fit my son the best. You know your boy, so take him and his likes and dislikes into account before anything else. Readers asked for the by age lists and because I want to help, I am writing them all. Be sure to check out the other lists close in age to this one because you will find great books there as well. Everyone reads at different levels no matter what their age. Being eight doesn’t mean he will, or even “should”, be reading at a third grade level. Just focus on your own boy and his interests and you will do well selecting just the right books for him. Keep in mind the end goal, so to speak. We want our boys to love reading. Everything should surround that simple goal. And now . 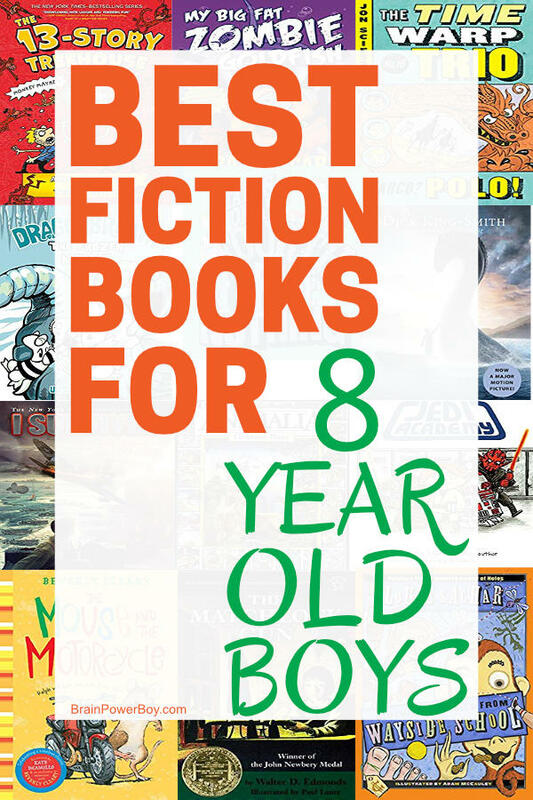 . . the best books for boys age eight! I have split this list into two sections. A fiction section and a non-fiction section. Selecting from both sections is probably your best bet. Be sure to take some time to show him the list as well so he can choose his own books. The books are not listed in a particular order so simply scroll through and see which ones they will enjoy. After book three, Jarrett Krosoczka became the author. All the books are good, but we did like the first ones better. These are almost like a comic book, but they are also like a graphic novel, or perhaps they are like being able to see someone’s notes scrawled across the pages. No matter that they are hard to describe, because boys eat these up. Start with the first one and go through book three. If your boy likes them, try book 4 and see how it goes. At this time there are more than 6 books and they are continuing to write them. The basic premise is middle school Star Wars style with a lot of funny happenings. If I called Animalia the best alphabet book ever, would you think that was saying too much? I don’t. It totally owns the trophy. I am big into alphabet books (see best alphabet books for older readers for more details) and this is my hands-down favorite. If you are wondering why I am including an alphabet book in a list for 8 year old boys, just trust me. If you do not already have this book, get it. If you already have it, by all means, get it out again. Eight is the perfect age to “get” all of the extra parts of the book. And there are so many extra parts. The hidden pictures, the alliteration, the gorgeous artwork. Plus, did you know there are more than a thousand things to find? True! Animalia is a book that should be on everyone’s bookshelf. Don’t miss the Time Warp Trio books. Especially if you want to slip in a bit of basic history, or if your boy likes adventures. We both really enjoyed these and read a lot of them. There are over 15 books in the series at the moment. In Time Warp Trio Marco? Polo!, which is one of the latest, the boys end up in thirteenth century China and meet explorer Marco Polo. All of the books are filled with comedy, exploration, a bit of trouble and the boys working together to try to get back home. Like The Time Warp Trio above, the I Survived series focuses on historic events but these books are much more realistic and are considered to be historical fiction. Each book covers a historical event and is told through the eyes of a child. Many of the books feature boys. which is great as boys like to read books about how other boys overcame obstacles. There are plenty of facts in the books which are surrounded by a great and exciting story which often includes escaping death. The I Survived stories are exciting to read! I was trying to think of one word to describe these books and I landed on madcap. I think that totally fits. Andy and his friend Terry live in The Thirteen Story Treehouse. And it is not an ordinary treehouse by any means. It has a game room, a bowling alley, a huge catapult, and much, much more. The books are filled with craziness and silliness and are totally page-turners as you pretty much *have* to find out what happens. A few parents complained about violence but generally speaking it isn’t too terrible. I found it to be pretty silly cartoon-like violence and fitting of the story. If you have a sensitive eight year old you may want to read through them first if you are concerned. The illustrations are pen & ink line drawings done in black and white which are a good fit for the books. As the engaging series goes on they add more and more features to their treehouse. Book Series for 7 – 9 Year Old Boys! It was sort of hard to know what age group to put this one in as the images seem a bit young but the story line is geared toward 8 to 12 year olds. There are younger boys who enjoy this as well as those just above this age group. I personally think 12 is a bit of a stretch but some may like then for a quick entertaining read at that age. What happens when a fire-breathing dragon can’t breath fire? Well, that is part of what this book series is about. Danny can’t breath fire but he is also a rather fearless dragon. He has a best friend named Wendell who is a nerd. Together they go on adventures/missions, and solve mysteries. The books are fun. They feature both comic book panels and sections of text which is a good mix as it makes them a bit less intimidating for those who are not yet ready to read big chapter books. In Dragonbreath The Frozen Menace, Danny and his friends search for a magical ingredient to kindle his fire. I am going to assume that most of you have read Judy Bloom before. Perhaps you have even read Tales of a Fourth Grade Nothing. It was originally published in 1972. This is the book in which we meet Fudge and his brother Peter. Fudge is what one would call a mischief-maker. He annoys Peter who thinks he is a ‘two-year-old terror.” Peter has had it, and he is determined to get his parents to see Fudge as the problem he is. This book is, of course, funny but in true Judy Bloom fashion it hits at the heart of what kids are feeling. Great for kids who have siblings or who have to deal with similar problems as it shows them they are not alone. His name is Frankie – the goldfish that is. Tom’s big brother is an evil scientist who may have killed Tom’s goldfish by doing an experiment on him. Tom zaps Frankie with a battery to bring him back to life and we end up with the My Big Fat Zombie Goldfish stories. Whew – that is quite the beginning! It stays crazy funny throughout all of the books. These books are very likely to make your boys laugh out loud, and better yet they will want to read several of them! We read this long ago and I still remember it as a wonderful story. The Water Horse is the story of 8-year-old Kirstie who finds an egg. She keeps and and hatches it. Her grandfather is the only one who knows what the unusual creature is. They have a slight problem beyond housing an unusual creature that they don’t really want others to know about . . . it keeps growing! The protagonist is a girl but do not let that put your boys off. The water horse alone is enough to grab his focus and he will want to keep reading if you start the book. As you can see, this list is a mix of old favorites and newer titles that are likely to be around for a long time because they are popular. The Mouse and the Motorcycle is all boy. It has a boy in the story, a boy mouse and has a whole lot of boy appeal. There is plenty of adventure, a touching friendship and more to love about this book. If it is too much for your boy to read on his own, enjoy it with him. Louis Sacher has an unusual sense of humor and he puts it to good use in Sideways Stories from Wayside School. I added this book to the list for two main reasons. Boys age eight are sure to think it is a hoot and the book is broken into super short stories of approx. 3 – 5 pages long each. This is great for boys who may not be ready to read a standard chapter book as they can read a story within a short period of time. Or, if they enjoy it, they can keep going and read several. These also make nice stories to read before bed, or to take along in the car or if you need to go to an appointment. Everything about this book is pretty much silly so expect a good bit of laughter when reading. I remember reading this to my son. We read it all the way through in one sitting. It isn’t a long book but even if it had been, there was no way we were stopping until we got to the end. A Newbery Medal winner from 1942, The Matchlock Gun is a story of Edward (10) who is tasked with protecting his family during the French and Indian war. To do so he needs to be able to use the very large matchlock gun his father showed him how to use. This is an engaging and intense book that will certainly have him turning the pages and reading as quickly as he can to find out what happens. Personally, I would read the book with your boy so you can explain some of the things that happen. Do not miss out on getting him some non-fiction titles! They were actually much more popular with my boys book club than the fiction books were. I like the National Geographic books for their photos, easy to read style, and how they pack in the information. NG 5000 Awesome Facts (About Everything) is no exception. There are facts about everything from spies & mummies to peanut butter and candy. It is a complete mish-mash of factual bits and pieces on all sorts of different topics. They love these – fyi. I tried these with my book club and they couldn’t stop telling each other tidbits out of them. If you already have the first one (pictured,) try the latest version. I choose Star Wars, The Last Jedi Incredible Cross-Sections for this list because this is such a great age for both Star Wars and the cross-section books. There are other cross section books as well, but if you have a Star Wars fan, try this one. It is really good. They will be amazed at the phenomenal detail shown in the vehicles. There are many of these books to choose from. Select based on the topics they enjoy. See them all here. The Worst-Case Scenario Junior Weird edition is based on the original book but more kid-friendly. In this case, it is “weird” stuff they are going to be taught how to survive. We are talking aliens, zombies, time travel, mummies, ghosts, magic and more. He really does share how one would survive in these situations which makes it both informative and funny. He includes both interesting facts and real science and history. They are fun to read and I just bet your guy will have to tell you all about what he would do or what he learned about zombies. If your family doesn’t do sci-fi, weird, or ghosts and magic there are other versions available as well. The updated, new edition of The LEGO Book is out! This is a great one for your boy to have on his bookshelf if he is a LEGO fan. It includes a lot of info about LEGO, The LEGO Group, sets, facts and a whole lot more. They even go behind the scenes so you can see bricks being made – cool! There are a lot of pictures to look at and all types of LEGO goodness. Perhaps, some of your guys already have this one since I see there have been over 1.5 million copies sold. If not, you should consider it. There is so many ideas in The Dangerous Book for Boys. It is simply packed with fun things for boys to do. I’ll list a few here: identify spiders, tie knots, learn to fish, make a slingshot, learn about astronomy, early American history, artillery, make a pinhole projector, a pocket light or a periscope. It just goes on and on. It is a great book for getting them off screens and doing things! He will enjoy reading about Odin, Thor, Loki, giants, gods and goddesses in this beautifully illustrated classic book. There is violence, drinking etc. but Book of Norse Myths was actually written for children. That said, it was written in 1967 which was a different time than we live in now. They will have a good overview of the myths by the time they are done going through this book and are likely to really enjoy every minute of it. In my opinion it is still the best book on Norse Myths out there. If you take a look at my other book lists for boys by age you will see that I include some sort of encyclopedia or dictionary in them. Generally speak, you really can’t have too many of these types of books at home. We have many and they all get used. Picturepedia, put out by DK and Smithsonian, covers science and technology, nature, geography, culture, sports, hobbies and history. It is not only fun to browse through, but it is also great when they have a quick question. There is a hefty index at the back so they can find what they are looking for. It is an all-around great book. I always enjoy finding a good pop-up book. This fits the bill. In addition to the stunningly awesome pop-ups, there is a lot of solid information presented in bite size pieces. The overall style of Bugs A Stunning Pop-up is very appealing as well. It has an antiqued page look and it makes you feel as though you are peaking in on someone’s display or looking at their notebook. The only complaint one might have is that it is short. However, it is very well-done and there is plenty there to keep one interested. Plus – the pop-ups are incredible. Have a sports buff on your hands? If you do, you can take that love of sports right into books. A Year in Sports has a new book come out each year. It takes a look at the past year in the world of sports and everything that happened. They are not expensive books, yet are filled with big color pictures and have close to 200 pages. They cover everything from top 10 moments, to who made MVP, to championship games. There is a big list of sports that are covered. Sure to get them reading. So. Good. This reads like a story but is also packed – really packed – with pirate facts. This book is completely interactive with, as one might expect, a treasure map. The treasure map has missing pieces which the reader has to locate. There are a lot of charts and maps and even lift-the-flaps and a whole lot more in Pirateology. It is one of our favorite pirate books. See the other pirate titles we liked here. After working our way through a lot of different paper airplane books we settled on this one as our favorite. You can read more about it by following the link above but generally speaking what I liked was that it actually covers why paper airplanes fly and gives you some super plane designs to make. We had a lot of fun with Kids Paper Airplane Book and still pull it out when we are making more planes. Obviously not for a boy who is afraid of snakes, but I know a lot of boys who are super fascinated by snakes and all things reptiles so they will love it. If you happen to have one of those boys Everything You Need to Know About Snakes is a perfect fit. If you have a boy who isn’t into snakes but perhaps likes sharks, bugs, frogs, dinosaurs, or birds, you can find those here. I hope you found just the right books for your 8-year-old boy. Keeping boys reading at this age and beyond is important. If your boy is not a book person, this can get harder as they get older. Finding the best books is key. We are here to help you do just that. If you ever need help selecting books feel free to leave a comment. Be sure to check out our other lists as well since there is sure to be some cross-over between ages. 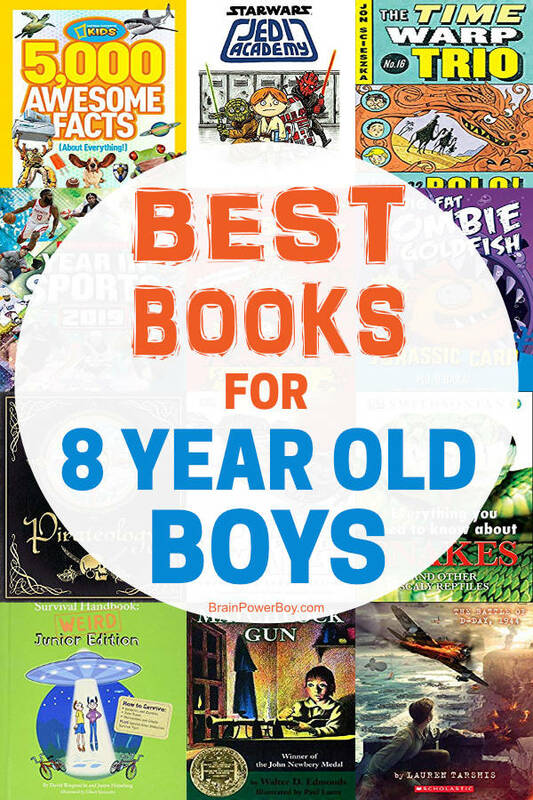 Best books for 9 year old boys is coming up next!